The Cataracts exhibit the phenomenon of scattering of light caused by particles of adequate size that are formed within the lens. Here we consider some of the most relevant physic-chemical aspects associated with cataracts, from the Tyndall effect in the evolution of the species, as well as possible mechanisms of formation. Cataracts are the loss of visual acuity caused by the decrease in the transparency of the lens (with the concomitant gain of opacity), when light passes through it. Instead of a transparent medium, light passes through a medium full of fine particles, like fog illuminated by the headlights of a car [1,2]. The mechanisms proposed so far [3-5] to explain the facts are not free from objections and / or need a better understanding of the transformations occurred. This is because the system under study, and in particular the lens, has an enormous complexity, both in structure and in their functions [6-8]. With an integrative vision of the world we live in, we are trying to describe consistently in this paper the most important physical-chemical associated with cataracts, possible mechanisms of formation and the biological aspects that may be relevant to the topic. Cataracts are seen when light passes through the eye, are due to diffraction caused by small particles that are distributed non-uniformly in the interior of the lens. Since this collective phenomenon of scattering is not specific of the Eye [9,10], we felt it could be of interest to devote a few lines. Let’s see, therefore, that the eye in general and of humans in particular is integrated in its environment. The so-called Tyndall effect [11,12] (Figure 1), is much broader than would be expected. Appears when visible light passes through a medium in which exist particles of a size comparable to the wavelength of light. Its impact on them will diffract light, and if it is complex, it will decompose into its components, being the blue the one that makes it with more intensity (Rayleigh scattering). For a little larger particles, there is scattering (Mie scattering) with little decomposition. The dispersion is asymmetric in the latter case, being stronger in the sense of the progress of the light rays. 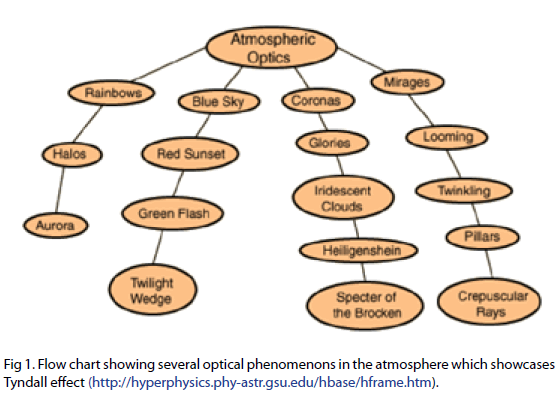 Figure 1: Flow chart showing several optical phenomenons in the atmosphere which showcases Tyndall effect (http://hyperphysics.phy-astr.gsu.edu/hbase/hframe.htm). There are too many examples of natural Tyndall effect, thus we consider only some of them. The blue colour of the sky, the pink of dawn and sunset, the colour of clouds, the colour of the ocean water, are manifestations of this effect that are based in the quoted situations. Light rays passing through certain areas, such as churches and internal depth of some forests (Figure 2); fog illuminated by the headlights of a car, also show this phenomenon. If it was not for the Tyndall effect, the sky would not be blue, but black. Figure 2: The presence of the atmospheric dust explains the visibility of the sunlight in its journey through the deep woods. Certain minerals, such as smoky quartz and milky, show this, which is due to tiny particles of graphite and air portions scattered respectively in both cases in the cited minerals. The whiteness of the foam of the waves (Figure 3), of the egg whites beaten or of the foam of the soap, are other examples of aerosol, in which small portions of air are scattered within a continuous medium. Note that in the case of minerals, the scattered system has been frozen since its crystallization occurred. 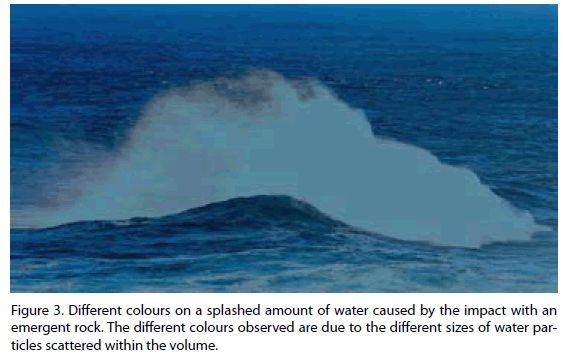 Figure 3: Different colours on a splashed amount of water caused by the impact with an emergent rock. The different colours observed are due to the different sizes of water particles scattered within the volume. Colloidal solutions also show this phenomenon. The examples here are numerous and sometimes very striking. The colloidal silver and gold are well known in Inorganic Chemistry. The purple Casius is an aqueous solution of colloidal gold. Macromolecules also tend to form colloidal solutions. The colours of certain animals, such as the butterflies, the birds of paradise (quetzal), etc. are explained by the Tyndall effect. All these examples belong to our habitat, beyond which the Tyndall effect appears due to the abundance of cosmic dust  together with visible light coming directly or indirectly from satellites, planets and stars. 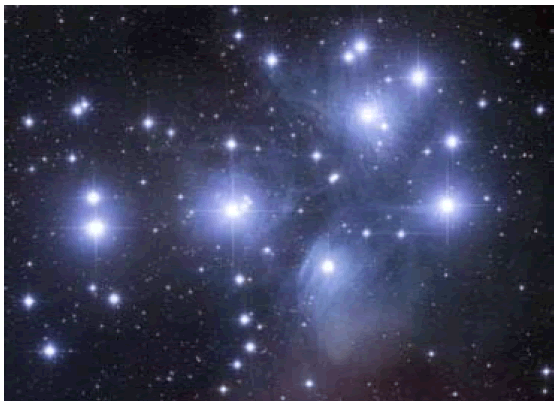 A well-known example is the one of the Pleiades (Figure 4) , an open cluster, where the brighter starts exhibit the typical blue halos. In the case of cataracts, the presence of particles within the lens causes the same phenomenon, generating a loss of transparency of the ocular lens and a parallel increase of its opacity, influencing vision in a negative way. We can consider the protein as the great triumph of current scientific knowledge, in which mainly the physical-chemistry and biology converge. The most complex Organic molecules, dominated by carbon, are far more complex than the micro crystals of clay, dominated by silicon, which belong to the inorganic world. The triumph of life on this planet is because of the main features of the proteins, especially because of its enormous versatility, since they are not only structural materials but also carry out many functions. The universe of proteins is immense, so we will just remember that they are polymers of amino acids, in which the chain of carbon atoms is preserved when they join to form new covalent bonds, the strongest in chemistry. The strand formed is typically folded and this is much more stable than the unfolded. A summary of these forms appears in the following figure (Figure 5). The lens is formed mostly by cells that grow continuously with age. They are arranged in layers, containing highly concentrated protein solution, called crystallines. Transparency depends on the stability and solubility of the _, _ and _ crystallines [6,15,16]. The diversity of the protein molecules represents the triumph of evolution, since they act as either support or structural elements for the construction of any living being or as being responsible for certain functions, being one of the most important the vital function . Therefore, they are the main characters of the living beings. Being so wonderful, however, has a price, which in this case is a feature that is unique and that has to do with its transformation into aggregates of many of them, who come to be transformed into particles, which are the cause of loss of the lens transparency. Despite the work done so far, both theoretical and experimental, the same in vivo as in vitro, it is not yet known with sufficient accuracy the acting mechanisms that lead to the formation of a scattering system of particles, responsible for the cataracts. What is more reasonable to assume is that proteins in solution are in a native state , in other words, folded. This can be explained because the folded state is much more stable than the unfolded state. Under the action of free radicals (ROS) proteins can oxidize, doing it especially when -SH groups exist, which are easily converted into disulfide bridges (-SS-) wherewith the molecular mass doubles. If this process as usual, is repeated, the result is the formation of aggregates, which finally transform into particles, which are responsible for most of the cataracts. Unfolded proteins are easier to oxidize that folded, but as its concentration is much lower than the latter, the production of particles by this route must also be negligible compared to the one initially considered. Below we’ll talk about the oxidizing. The most important are the ROS [1,3], the superoxide anion, hydroxyl radical and hydrogen peroxide. For its stability and mobility, the most important is the last. Given its origin they can be endogenous and exogenous, the first occurring primarily within the mitochondria and the second by the action of UV radiation and / or ionizing [17,18]. The singlet state of O2 in the molecule, result of the photochemical energy absorption by oxygen, usually behaves as an important ROS . The term singlet means that there is a unpaired electron, which is responsible for the high activity of the electronic configuration of the molecule of oxygen. The effect occurs when the electronic crust of oxygen receives the impact of a photon. Summarizing the above we can say that: The ROS oxidize proteins selectively, after which the remains of the molecules formed can get together, growing in size. If the process is repeated, it could be formed an aggregate of large molecular mass, in other words, a particle. Another possibility is the oxidation of the partially form or totally denatured, which could get fragmented. Quite rightly metabolism has been called the fire of life. Part of the energy released in metabolism is used in the formation of ROS, which can be considered as covalent atomic groups whose mission is to provide an appropriate vehicle to unpaired electrons, which have a great oxidant power, because they tend to form pairs with electrons of the present substances, which are oxidized. Therefore, the speed of production of ROS, excluding the ones of photochemical origin, should be proportional to the speed of metabolism, which, in turn, is given by a simple equation, in which as the independent variable appears the mass body, raised to an exponent, called of scale, whose value is 0.66 [19-24]. Most biological reactions are surface reactions, therefore, its speed is proportional to the amount of surface involved in the reaction. Are precisely the mitochondria (Figure 6) the objects that provide a large surface on the inside, as if it was a maze, and within them, the ROS are created, from where they migrate to the outward in its attempt to equalize the concentrations. Diffusing through the cellular medium, the ROS react with molecules that are find in their path, and in particular with dissolved proteins, which can be transformed into particles. 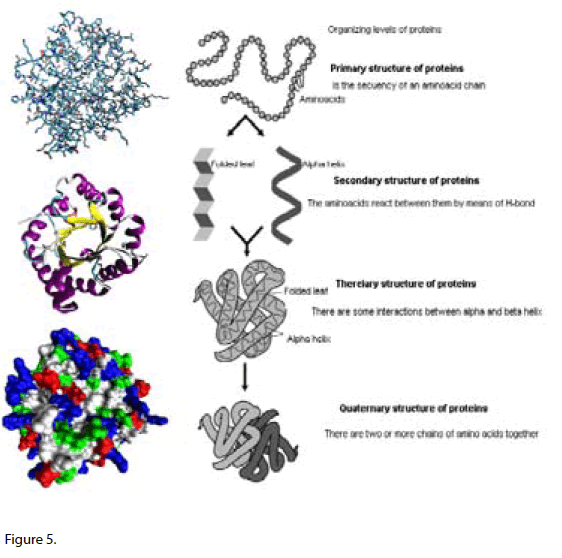 From a theoretical point of view two types of protein can be considered, the folded state and the unfolded state, from which the first, being the most stable, is also the most abundant. This situation is the one given in the eye, occurring as well that the unfolded protein oxidizes more easily than the folded [25,26]. It is as if the greenery of the folded form protects the active centres of the arrival upon them of ROS. Conceptually, from this analysis it is possible to infer that the mechanisms of particle formation should be different for both types. For the simplicity and the low concentration in the eye of the unfolded proteins, in this discussion we will refer only to the oxidation of folded proteins, until they reach proper sizes. Combining the above aspects it is concluded that the speed of production of ROS is, the same as metabolism, proportional to mass raised to the same exponent. Figure 6: In the mitochondria metabolism is favored because it is a reaction of gas-solid surface. 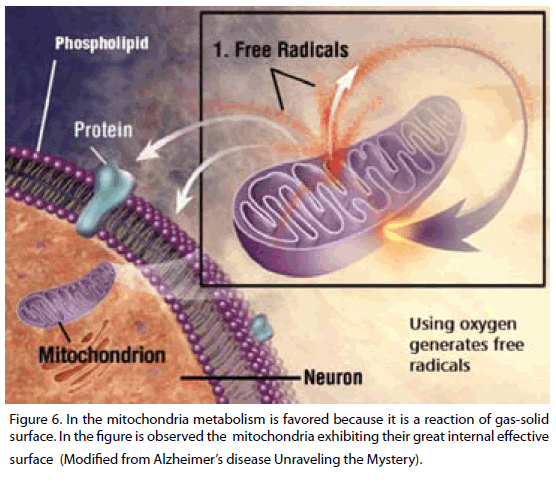 In the figure is observed the mitochondria exhibiting their great internal effective surface (Modified from Alzheimer’s disease Unraveling the Mystery). The main mechanism of oxidation is the formation of disulphide linkages (-S-S-) from remains -SH, in other words, the formation of an aggregate of two molecules, doubling the molecular mass. If this process is repeated, they will become particles. [27-32] of sizes of about 2.107 Da., appropriate to diffract light. The above study clearly shows that the mass of the body is a risk factor for the appearance of cataracts [33-37]. As is well known the speed of all processes depends on the temperature of the system within which those changes occur, whether they are physical or chemical. It happens that the speed of these changes increases with increasing temperature and, conversely, decreases when the temperature decreases. A rough guideline is that an increase of 10 degrees doubles the speed. As for each process, the speed depends on the time elapsed for completion, these times are therefore small for high temperatures and, conversely, are big for low temperatures. An issue as trivial has great evolutionary implications. Inert objects such as minerals can exist without decomposing, within broad ranges of temperature, in general, from the lowest (in the order of a few Kelvin degrees) to hundreds of degrees (melting points). But for the living, the temperature range is much narrower. The lower limits match approximately to each other, but upper limits are quite different, since the life bonds are broken at 160 ° C and the most resistant bacteria’s can live at 113 º C [38,39]. At low temperatures, even close to absolute zero, the almost null activity determines a very extensive life time. This particular state has been called dormant state. Cataracts, as seen above, are due to changes with time of the lens proteins, which has maintained its temperature along the same, since we exist as species. If we consider them as a general pathology of the eye of living beings and in particular of the mammal’s eye, we find that the temperature has varied along the succession of species. From values very close to the ones of the environment, for the most primitive species until values of around 30 degrees to mammals, primates and hominids. This increase in temperature explains that evolution times have been declining. Taking in account the above circumstances, a state of compromise is reached for the temperature value that is compatible with evolution times. Occurs that if the temperature increases cataracts appear before and the time of speciation is smaller, and conversely, if the temperature decreases. For our part we have estimated that at a temperature of 30ºC humans would be free of cataracts (as they would appear, on average, at the age of 180 years, rather than at the age of 60), but hominization, in other words, the change in species from a chimpanzee to the homo sapiens-sapiens, would have used 9 million years. At a higher temperature the opposite situation would occur. If t = 41ºC, cataracts would appear at the age of 28 years and the time of hominization would be 0.6 million years, perhaps too short for the occurrence of the relevant adaptations in the eye. The highest speed in the evolutionary process at high temperatures and therefore the shorter evolution time could not have been long enough for the construction of certain structures, from which one could have been the eye. Thus, we conclude that the temperature of 36.5ºC in the human species can be interpreted as the result of a compromise between two opposing effects. However, the high temperature of mammals shortened much the later times of speciation. Because of its special features, the eye has always been considered one of the most perfect organs of living creatures in general and of humans in particular, having been compared to a camera , even exceeding the benefits of it. It is curious to note that recently the so-called nanotechnology already existed at the dawn of the beginning of life on this planet and that it solved problems that we still do not understand in a full scope and significance, being sufficient to cite the proper origin of life from materials in soil, and from others formed in the so-called prebiotic chemistry . Referring to the eye, many of its components call the attention, and in particular the nature of the lens, an organic object designed especially to produce refraction of light and focus it on the retina [3,42], obtaining in this way the extraordinary phenomenon of vision. During the evolution of the inorganic world on this planet a wall that stopped the evolutionary process was created. Is what the first replicators seem to demonstrate, (micro crystals of clay), and polymers of silicon (silicates) in which the absence of plasticity at appropriate temperatures (of the existence of the three physical states of water), made impossible a greater approach towards the birth of life . The inorganic project of life, silicon-based, was largely overcome with the advent of the abiotic polymers of carbon. In any case, the stabilities of the molecules are favorable for the vast majority of the inorganic, even if, by fortuitous circumstances, they are isolated from the presence of other aggressive molecules, especially from the ROS. Where can we find inorganic structures that show an attempt to build similar systems to the lens in form and function? Layered structures in the inorganic world are found in certain silicates, such as the so-called lamellar (clay, talc, etc. ), in graphite, in the nacre and in pearls. Being these nearly spherical, it seems that they approximate to the shape of the human lens and much more to the fish one. This is transparent and pearls are not because they are made up of several layers of calcium carbonate. These layers reflect in part the incident light, being the remainder absorbed. The reflected light behaves in a similar way as it occurs with thin slides, being the oily stains widespread on the wet pavement, or soap bubbles. In summary, we might note that any other system different to the lens itself, it would have been practically unworkable in the construction of the visual organ of vertebrate organisms. Studies have been conducted on the influence of UV radiation, ionizing and X in the lens of various animals [31,43] and of cataracts in domestic animals . In these matters we will not enter because they exceed the boundaries of our work. However, we will do some observations about it. Since, as we said the cataracts are very sensitive to the temperature of the lens, it is hoped that the time of its appearance is also sensitive to that same variable, so the appearance of this pathology in reptiles must differ significantly from that for mammals. Probably the main difference would be due to the different temperatures that, with other factors being equal, would make the first more resistant than the second against cataracts and possibly against cancer. The kind of food should also influence. The case of certain birds can serve as examples in animals of similar temperatures. Because of their masses they should have longevity as a mouse, but some reach the hundred years [45,46]. Where is the secret? For now the only explanation is the diet rich in antioxidants [47,48], which would react with the free radicals, destroying them. The presence of delocalized electrons in them would explain their behavior, which as we have seen, have an unpaired electron ready to link with an delocalized electron, as it occurs for example with ascorbates tocopherol and carotenoids . The analysis carried out on the identification of insoluble matter in water suggests that apart from the oxidation reactions, some others are involved . 1. - The Tyndall effect shows the integration of living beings and particularly that of human beings in the environment. 2 .- The ocular metabolism is responsible for the production of free radicals, so the mass of the individual is a risk factor in the appearance of cataracts. 3. - The temperature affects the time of appearance of cataracts and the time of speciation (mammals Homo sapiens) in the opposite direction. 4. - The necessary plasticity of living tissues, diverted the evolution of molecules to the compounds of carbon, not silicon. 5. - In summary, it seems necessary a major contribution of work, both theoretical and experimental, to achieve a more realistic understanding of the facts involved in the deterioration of the lens. Lou MF. Redox regulation in the lens. Progress in Retinal and Eye research 2003;22,657-658. Bloemendal et al. Ageing and vision: structure, stability and function of lens crystallins. Prog Biophys Mol Biol Nov 2004;86(3):407-85. Spector A. Oxidative stress-induced cataract: mechanism of action. The FASEB Journal 1995,Vol 9;1173-1182. Benedek GB. Cataract as a protein condensation disease. The Proctor Lecture. Investigative Ophthalmology and Visual Science 1997;Vol 38,Nº 101. Hanson SRA, Hasan A, Smith DL and Smith JB. The major in vivo modifications of the human water-insoluble lens crystallins are disulfide bonds, deamidation, methionine oxidation and backbone cleavage. Exp Eye Res 2000;71,195–207. Testut L and Latarjet A. Tratado de Anatomía Humana, Tomo III, Salvat Editores, S. A., Barcelona, 1988; p 625-648. Jaenicke R. Protein stability and molecular adaptation to extreme conditions. Eur J Biochem 1991;202,p 715–728. Kanski JJ Oftalmología Clínica. Elsevier, 5ª Edición, Madrid, 2004;p. 186-194. Simon RP and Abele JS. Spinal-fluid pleocytosis estimated by the Tyndall effect. Ann Intern Med Jul 1978;89(1):75-6. Hirsch RJ, Narurkar V and Carruthers J. Management of injecte hyaluronic acid induced Tyndall effects. Laser Surg Med Mar 2006;38(3):202-4. Tyndall J and William F, editor. Scientific memoir, selected from the transactions of foreing academics of science and from foreing journals. Natural Philosophy 1853;359 _1_. Tyndall J. Lectures on light, N. Y. D. Appleton and Company 1873. Greenberg JM and Pirronello V, editor. Chemistry in Space, Kluwer, Dordrecht 1991. Audouze J and Guy Isra’l, editores. The Cambridge Atlas of Astronomy. Cambridge U. Press. [1st Edit.] 1985, HB, dj, B&W & Color photos, mint. Delaye M and Tardieu A. Short-range order of crystallin proteins accounts for eye lens transparency. Nature 1983;302(5907),415-417. Fernand RD and Weright SE. Maintenance of optical quality during lens growth. Nature 1983,301,618-620. Beckman KB and Ames BN. The free radical theory of aging matures. Physiol Rev 1998 Apr;78(2):547-81. Ames BN, Shigenaga MK and Hagen TM. Oxidants, antioxidants and the degenerative diseases of aging. Proc Natl Acad Sci U S A. Sep 1,1993;90(17):7915-22. Beckman KB and Ames BN. Mitochondrial aging: open questions. Ann N Y Acad Sci 1998 Nov 20;854:118-27. Heusner J. Size and power in mammals. J Exp Biol 1991;160,25-54. Dodds AJ, Rothman DH and Weitz JS. Re-examination of the _ law of Metabolism, J Theor Biol 2001;209,9-27. White CR and Seymour RS. Mammalian basal metabolic rate is proportional to body mass2/3. PNAS 2003;100,4046-4049. White CR and Seymour RS. Allometric scaling of mammalian metabolism. J Exp Biol 2005;208,1611-1619. West GB and Brown JH. Origin of Allometric scaling laws from genomes to ecosistems: Towards a quantitative unifying theory of biological structure and organization. J Exp Biol 2005;208,1575-1572. Shannon LF, Kosinski-Collins MS and King J. Interdomain side-chain interactions in human _D lens influencing folded and stability. Protein Science 2005,14,2039-2043. Boscia F, Grattagliano I, Vendemiale G, Micelli-Ferrari T, Altomare E. Protein oxidation and lens opacity in humans. Invest Ophthalmol Vis Sci 2000 Aug;41(9):2461-5. Ortwerth BJ, Oleson PR. Age-related nuclear cataract: A lens transport problem, Exp Eye Res 1988;47:737-750. 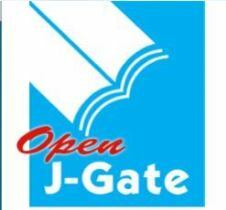 Nagaraj RH, Sell DR, Prabhakaram M, Ortwerth BJ and Monnier VM. High correlation between pentosidine protein crosslinks and pigmentation implicates ascorbate oxidation in human lens senescence and cataractogenesis. Proc Natl Acad Sci (USA) 1991;88,2222,10257-10261- ,11/1991. Lou MF, Dickerson JE Jr and Garadi R. The role of protein-thiol mixed disulfides in cataractogenesis. Exp Eye Res 1990 Jun;50(6):819-26. Lou M F et al. Further studies on the dynamic changes of glutatione and protein-thiol mixed disulfides in H2O2 induced cataract in rat lenses: distributions and effect of aging. Curr Eye Res 1995 Oct;14(10):951-8. Lou MF. Thiol regulation in the lens. J Ocul Pharmacol Ther 2000 Apr;16(2):137-48. Davies MJ. Radiation Chemistry at the RCDC. J Phys Chem Ref Data 1988,17,513-886; J Phys Chem 1988,17,1027-1284,1997. Caulfield LE, West SK, Barrón Y and Cid-Ruzafa J. Anthropometric status and cataract: the Salisbury Eye Evaluation project. American Journal of Clinical Nutrition 1999,Vol 69,No 2,237-242. Schaumberg DA, Glynn RJ, Christen WG, Hankinson SE and Hennekens ChH. Relations of body fat distribution and height with cataract in men. American Journal of Clinical Nutrition 2000,72,6,1495-1502. Jacques PF et al. Weight status, abdominal adiposity, diabetes, and early age-related lens opacities. American Journal of Clinical Nutrition 2003;Vol 78,No 3,400-405. Lu M et al. Dietary fat intake and early age-related lens opacities. Am J Clin Nutr 2005,81(4),773-779. Lou MF, Rachdan D and Harding JJ. Glutathione reductase from human cataract lenses can be revived by reducing agents and by a molecular chaperone, alpha-crystallin. Curr Eye Res 2005 Oct;30(10):919-25. Pedersen K. Microbial Life in Deep Granitic Rock. FEMS Microbiol Rev 1997;20,399-414. Garzón L. Microbial Life and Tempertature: A semiempirical approach. Origins of Life and Evolution of the Biosphere 2004;34,421- 438. Mitchel HP. Fisiología general, Editorial Labor, S.A., Barcelona, 1936, p 195-215. Cairns Smith AG. Siete pistas sobre el origen de la vida, Alianza Ediciones del Prado, Madrid, 1994. Benedek et al. Theoretical an experimental basis for the inhibition of cataract; Progress in Retinal and Eye Research 1999;18,391-402. Kis AJ, Mirarefi AY, Ramakrishnans, Zukoskicf, Devries AL, Cheng CH. Cold-stable eye lens crystallins of the Antartic nototheniid toothfish Dissostichus mawsoni Norman. J Exp Biol 2004 Dec;207(Pt 26):4633- 49. Gelatt KN and Mackay EO. Prevalence of primary breed-related cataracts in the dog in North America Vet Ophthalmol 2005 Mar- Apr;8(2):101-11. Dorey CK, Granata L, Nichols CR, Cheng KN, Craft NE. Dietary modulation of lens zeaxanthin in quail. Exp Eye Res 2005 Oct;81(4):467-77. Munshi-South J and Wilkinson GS. Diet influences life span in parrots (Psittaciformes). Auk 2006,125(1):108-118. Varma S D. Scientific Basis for medical therapy of cataracts by antioxidants. Am J Cli Nutr 1991;53:335-45. Hartmann D et al. Plasma kinetics of zeaxanthin and 3-dehydrolutein after multiple oral doses of synthetic zeaxanthin. Am J Clin Nutr 2004;79:410-7. Espín de Gea JC and Tomás-Barberán F. Polifenoles y salud. Propiedades biológicas de los polifenoles de la uva y la granada. Investigación y Ciencia Mayo 2006;34-36.